We've seen this one before in a teaser video and then photographed alongside its arch nemesis, the Galaxy Note. 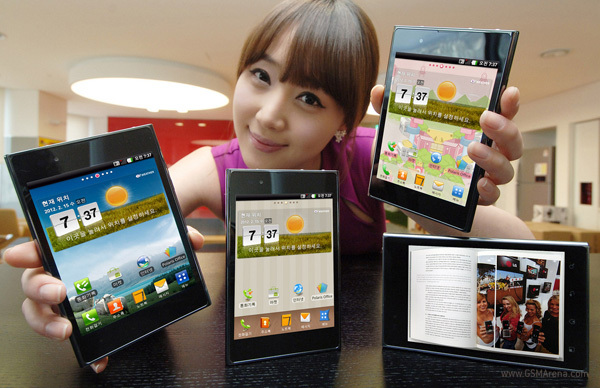 But LG has now officially launched the Optimus Vu in Korea and it comes with everything we have heard so far. For starters, you get a 5-inch IPS display with a 1024 x 768 resolution, which gives it an aspect ratio of 4:3. The display has a pixel density of 256 PPI, which is just short of Galaxy Note's 285 PPI. Due to the 4:3 aspect ratio, the Optimus (90.4mm) Vu is wider than the Galaxy Note (83mm), which will make it even more difficult to handle. It is marginally thinner (8.5mm) than the Note (9.7mm) but that's not going to matter much when you hold it in your hand. Other than that the Optimus Vu has a dual-core 1.5GHz Qualcomm Snapdragon MSM8660 processor with Adreno 220 GPU, 32GB internal memory, 8 megapixel rear camera with auto-focus and LED flash, 1.3 megapixel front camera, LTE, HDMI, DLNA, Wi-Fi Direct and T-DMB and a 2,080 mAh battery. The phone will launch with Android 2.3 Gingerbread but will soon be upgraded to Ice Cream Sandwich. The Optimus Vu will be available on SK Telecom and LG+ carriers in South Korea in early March. Pricing details are as yet unavailable. As mini tablet, it might be ok. But as a phone, this shape looks stupid, I mean, very. That fone is looking awesome maaaaaaannnn !! !